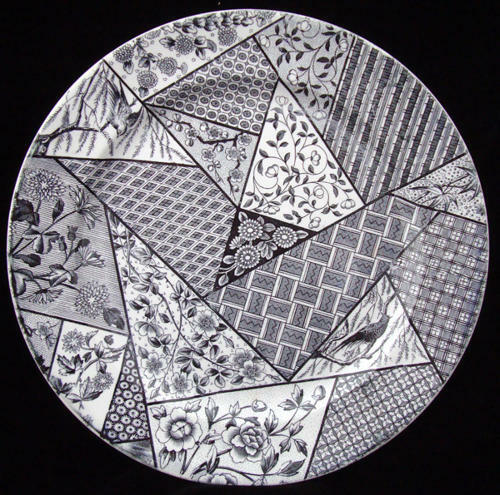 This very large Victorian aesthetic 10 1/2 " plate is crisply transfer printed in dark black. The pattern is decorated with a busy Aesethetic movement assymetric patchwork pattern along with flowers, plaids, zig zag, criss cross, paisley, a gorgeous Bird and loads of geometric whimsies, a fine example of a Japanesque influence and the Victorian love of nature and the exotic. Condition is great, clean and bright, appears to have never been used. The plate displays beautifully. No chips, no cracks, no hairlines and no repairs.